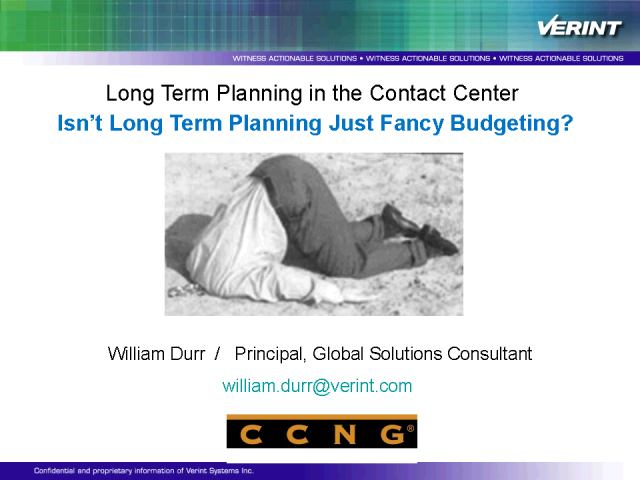 Contact Center: Isn’t Long Term Planning Just Fancy Budgeting? To position Strategic Planning properly, it is important to understand the basic differences between Strategic and Tactical Planning. Strategic is longer term, concerned with cost and staffing analysis, typically, several months or quarters into the future. It is not done daily or weekly and the people doing strategic planning are Directors, VPs and Financial planners. These requirements are served well by the Witness Strategic Planning function. Tactical Planning is primarily concerned with deploying daily and weekly schedules, considering factors like employee preferences, intraday changes and service level requirements. The people doing this are day-to-day operational people like schedulers and supervisors. These requirements are well served by the core Forecasting and Scheduling, Adherence and other Witness WFM functions. Because of the high ‘noise’ factors associated with day-to-day tactical planning it is difficult to visualize or plan beyond a few weeks. The bottom line in any business is that poor strategic planning leads to poor tactical execution which in turn produces poor results. Title: Contact Center: Isn’t Long Term Planning Just Fancy Budgeting?